We all want our home and garden to appear attractive – especially when there is a neighborly rivalry at play. 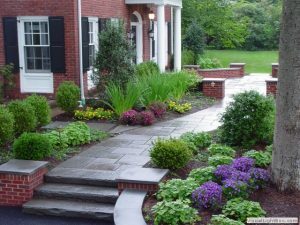 However, most homeowners aren’t interested in spending unreasonably high amounts of money to achieve the perfect landscape. Thankfully, there are easy walkway ideas that boost curb appeal and allow the whole yard to flow freely. A walkway made using natural stone is simply unmatched. You can acquire enough material to craft an entire walkway at just $5 per square foot. Of course, these stones must be set about 3 inches apart to ensure herbs and grass grow between them. Mulch and gravel are currently the cheapest pathing materials you can purchase, and they’re simple to work with, too. Just remove the sod, roll out some landscape fabric, then spread the mulch and gravel. The pathway will appear natural and clean. Stepping stones are an incredibly fast and effortless way to create a path. There is very little digging involved, and the stones can be spaced apart to allow growth. If you have wood laying around, or can find cheap wooden planks, you can easily dig up some dirt and lay down a path. There’s something about brick – that old-school look and feel. A path made of brick requires little upkeep, and is quite a tough material. The pathway leading to your front door is typically straight, but the material can be placed anywhere. You could lay out a simple path, then alternate colors, spacing, and grass. If you’re particularly creative, it’s possible to mix materials together for a single, aesthetically-pleasing path. For more walkway services, contact Blooms Landcare by calling (817) 688-5352. We’re happy to help beautify your home further using pathways and the right materials. So, call today!